It’s half the size of the Statue of Liberty, has flashing eyes and steam rising from its body as it towers over puny humans by Tokyo Bay. Godzilla? No, it’s Gundam, one of the most popular science-fiction robots in Japan. This 18-meter statue has attracted millions of fans since it was built in 2009 to honor the famous machine from anime, which looks like a futuristic suit of samurai armor. But a consortium of Gundam devotees and companies says it isn’t satisfied with a mere statue. It wants to build another six-story Gundam—a robot version that can actually move. The backers haven’t decided whether locomotion for the giant would be possible, though it seems unlikely. Nevertheless, such a colossal machine would be the first of its kind and would have to surmount significant engineering challenges. The consortium, dubbed the Gundam Global Challenge, is appealing to like-minded robot fans around the world for ideas on how to achieve this moonshot, which it hopes to accomplish in five years, the 40th anniversary of Gundam. 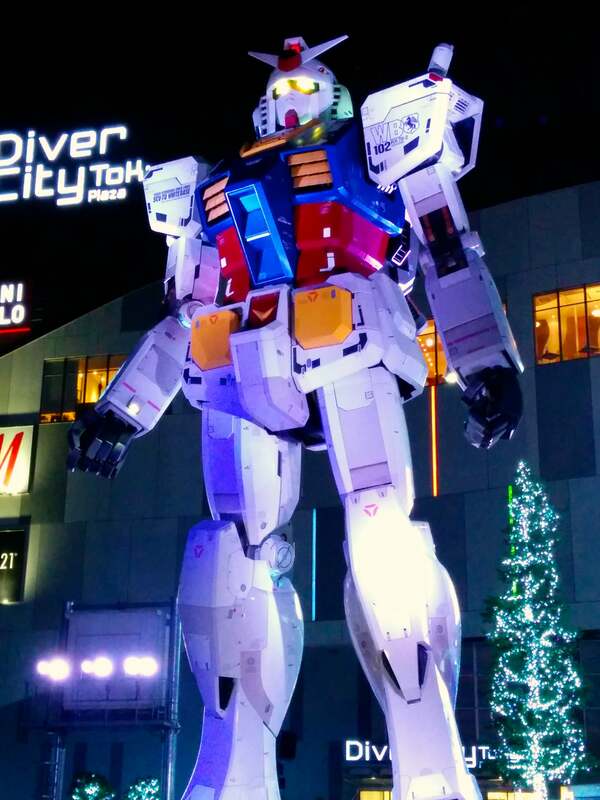 An 18-meter-tall statue of Gundam, a robot featuring in a popular Japanese science-fiction franchise, is lit up in Odaiba, Tokyo. 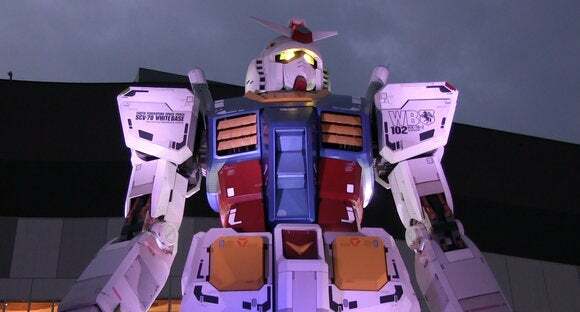 A group of companies and fans wants to create a moving, 18-meter-tall robotic version of Gundam. Launched as an anime series called “Mobile Suit Gundam” in 1979, the story focuses on the young Amuro Ray who pilots the eponymous combat robot RX-78 Gundam in a space war. Sometimes called the “Star Wars” of Japan, the franchise was praised for its realism and has inspired numerous sequels in various media including video games. To call Gundam popular would be an understatement. Gaming company Bandai Namco Holdings has sold over 430 million plastic model kits based on Gundam robots since 1980. For 2013, the 35th anniversary of the show, the company brought in ¥80.2 billion ($787 million) from Gundam products. Its success even inspired a government-related science website to estimate how much it would cost to build a real Gundam. Calculated in 2008, the total came to over $724 million, excluding labor. “Technologically, it’s a very interesting problem,” backer Shuji Hashimoto, a professor of applied physics at Waseda University, said at an event in July held to launch the Gundam Global Challenge project. A conceptual video produced by the consortium shows an animation of the Gundam robot moving its head and arms and bending at the waist. But is it within the realm of possibility for such a giant humanoid to walk? “I want to say, ‘Ha, ha, ha, impossible!’ meaning that no one will be able to do that except if someone will be able to make super-power actuators that can move the joints of the robot very fast to maintain balance,” Atsuo Takanishi, a professor of mechanical engineering at Waseda University, where the world’s first full-scale humanoid robot was built some 40 years ago, wrote in an email. It’s unclear how much an 18-meter robotic Gundam would weigh, but the existing statue, made of a steel frame covered by fiber-reinforced plastic, has a mass of 35 tons. A robotic version could weigh considerably more due to the need for actuators, controllers, batteries and other mechanisms. The cartoon, which goes into elaborate detail about the machine, lists Gundam’s total weight including weapons at 60 tons. “The most important issue is power,” Minoru Asada, a professor of robotics and engineering at Osaka University and co-founder of the RoboCup international robot soccer tournament, wrote in an email. Pitoyo Hartono, a professor of mechanics and information technology at Chukyo University who will help judge the ideas submitted to the Gundam Global Challenge, believes that the main problem for controlling a giant robot will be its many degrees of freedom, or the number of axes long which its limbs can move. If controlled by a human like in the anime, a joystick or steering wheel won’t do, Hartono said. The robot would instead have to adapt to the pilot’s movements, perhaps using a neural network with sensors and haptic feedback so that the pilot will feel when Gundam touches something. These technologies already exist, he said, albeit on smaller-scale machines. He doesn’t dismiss the idea of the giant Gundam walking around, perhaps in time to greet visitors to the Tokyo Olympics in 2020.